The Burnley star has been confirmed as a starter for tomorrow night’s clash with Denmark. 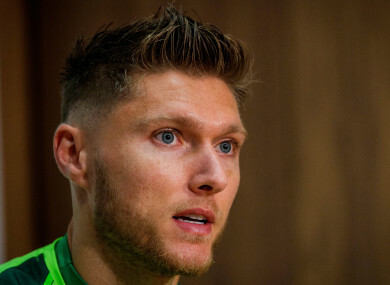 Jeff Hendrick pictured at today's press conference. IT’S A NEW international week, but familiar questions linger. Despite the controversy surrounding Harry Arter, Roy Keane and Stephen Ward’s Whatsapp having been discussed to death at this stage, Martin O’Neill continues to be quizzed on these matters. While the Irish sporting public has presumably had enough of this saga by now, the same cannot be said of our Danish counterparts. Visiting journalists risked Martin O’Neill’s wrath by pressing the Irish boss on these well-publicised matters, but the 66-year-old coach was not in the mood to elaborate on what has been said before. Yet no doubt aware of the bad PR that the incident has created, it is perhaps no coincidence that the Irish camp today made explicit attempts to cast the assistant boss in a positive light. During this afternoon’s press conference, Hendrick revealed how a sit-down chat with Keane helped him to learn from his mistakes during the 4-1 Wales defeat, when himself and Conor Hourihane were plainly outplayed by Wales’ Ethan Ampadu and Joe Allen in the middle of the park. “[Roy], after the last game we played Wales and there were a few clips, that I didn’t do well in and I sat down with him and he talked me through it and helped me and I tried to put that into practice in the Poland game. And while Hendrick acknowledged that the performances in recent times have not been good enough both individually and collectively, the Burnley star emphasised that the Boys in Green were keen to make amends on Saturday evening against Denmark in Dublin. “I always enjoy playing for my country. It’s such a big game. We all want to perform well and get a good result on Saturday night. Meanwhile, Martin O’Neill, who confirmed that Hendrick would start the upcoming Nations League match, urged Hendrick to step up to the plate and attempt to reach the level of performance that arguably saw him emerge as Ireland’s standout player at Euro 2016 a few years ago. Email “Jeff Hendrick reveals sit-down chat with Roy Keane helped him recover from Wales woe”. Feedback on “Jeff Hendrick reveals sit-down chat with Roy Keane helped him recover from Wales woe”.